Detective Ted and the Case of the Missing Cookies by Melanie Joyce. This book my 4 1/2 year old loves. This has been his book of choice since we got it. He loves the story and asks questions about it every night. I love the illustrations but I’m not as keen on the story, I find it difficult to read at times as it rimes but there is a page that I seem to read in the wrong sequence every time. But I’m not the one this book is aimed at and Lucas loves it so I read it and he enjoys it. I love the illustrations, the way that the magnifying glass is embossed and has a glossy finish compared to the rest give it some added depth. Poor Edward and Sid are being invaded by someone stealing their food, straw and being disruptive in the middle of the night. So Detective Ted is on the case. It’s a fun journey and your child is taught a lesson of sticking up to bullies. The book is long enough to be a decent length of bedtime story for an early school age. The story is fun and the illustrations are great. I would recommend this to early school age children. 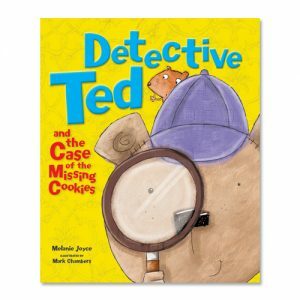 I hope there are more Detective Ted books to get my oldest for his Christmas. This book is by Igloo Books and is only £3.99 at the minute, a fantastic price and I will be buying more. Disclaimer:- This book was sent for the purpose of review and did not influence my review.